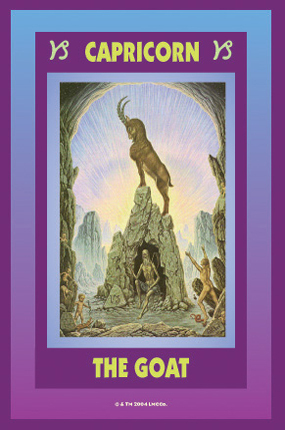 Capricorn the Sea Goat: December 22 - January 19; Cardinal Earth, ruled by Saturn. 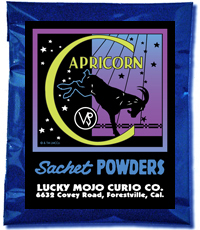 If you were born between December 22 and January 19, Capricorn is your sign. You are capable and brave, but sometimes too critical of those beneath you. You are very cool and calculating, seldom influenced by others, and make an excellent student. Your ambition should lead you to great success. Although you do not easily make friends, you are careful to keep your promises and will fulfill all trusts and obligations. The capacity to plan well and wisely for the future is a natural gift; you are tenacious and steadfast in your career. Money plays an important part in your life, for without a definite income, you are hampered in your ambitions. Your friendships, when chosen wisely, will last all of your life. 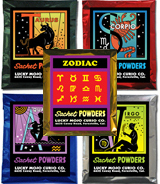 Your lucky day is Saturday. Birthday -- December 22 - January 19. Keywords -- Disciplined, capable, reliable, and uncompromising. Anatomy -- The knees, joints, and bones. 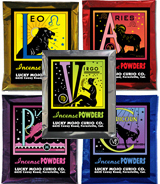 Lucky Colours -- Blue-Violet, Black. 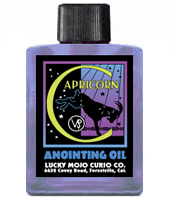 Order Capricorn Oil from the Lucky Mojo Curio Co.
Order Capricorn Incense from the Lucky Mojo Curio Co.
Order Capricorn Bath Crystals from the Lucky Mojo Curio Co.
Order Capricorn Sachet Powder from the Lucky Mojo Curio Co.
Order Capricorn Vigil Light Candles from the Lucky Mojo Curio Co.